To yearn for the sun. The whole film leaves me yearning for the Tuscan Sun...not just Bramasole (although, that's a big part of it). When Frances attends a "gay"cation in place of her pregnant best friend in order to lighten the weight of her recent divorce, she winds up buying a villa and staying in Italy. The name of the villa is Bramasole, which means "to yearn for the sun." It is a bit broken down and in need of renovations inside and out (coincidentally, so is she)...but with time, hard work, friends, love, family...it returns to its former splendor. No. It shines in a renewed splendor better than it ever was. With stories of friendship, love, family, and friends wound throughout...not to mention food and cooking scenes that warm my heart and make me "yearn"...I never tire of watching Under the Tuscan Sun , a film based on the book by the same name which contains (some of) the real-life adventures of Frances Mayes. (I actually adore all of her books...I recommend checking them out if you're not familiar with her work.) Sound girly? Well, I've never been ashamed of my love for chick-flicks. Stories of loss and renewal with laughter, a few tears...and some gorgeous guys...always brighten up my rainy days. As does a good bowl of soup. This particular bowl is garlicky, creamy, and laced with sunny herbs...total comfort that satisfies that yearning...warming me from my insides out. Happy food to brighten even the dreariest of days. Put ¾ of the beans in the jar of a blender with their liquid and the roasted garlic. Pulse until the beans are blended but still a bit chunky, adding more of the liquid (or water) if needed to keep them moving. In a heavy saucepot or Dutch oven, heat olive oil over medium and sauté onion until golden, ~5 minutes. Stir in tomatoes, rosemary, thyme and salt and pepper to taste. Lower heat and simmer for 5 minutes. Add remaining whole beans and simmer another 5 minutes. Add blended bean and garlic mixture and stir to combine. If soup seems too thick, add a bit of water (or cooking liquid). Simmer for 10-15 minutes to allow flavors to combine. Ladle into warm bowls and drizzle with Balsamic, if desired. While I love a good drizzle of Balsamic over any bowl of bean soup, this soup is also wonderful with a big glob of pesto swirled in (instead of the vinegar...this is how The Stinking Rose serves theirs). I am hosting Food 'n Flix this month, right here at girlichef. You have until May 30 to watch the movie and cook up something inspired by it...then send it on over to me for the roundup! My Legume Love Affair is hosted by Smitha at Kannada Cuisine this month. I have the movie PVR's so I can watch int on a whim. I am really ennjoying eating Italy these days!!! OMG what a delicious looking soup! 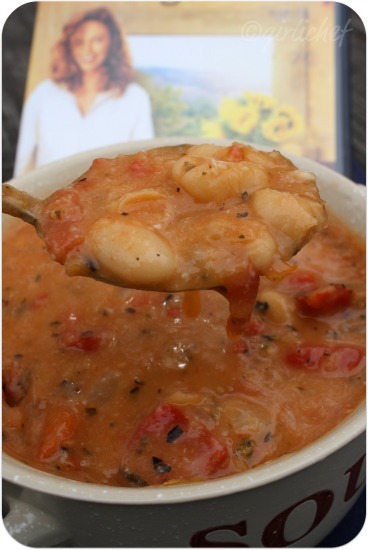 I'm a soup girl, ya know..
White bean soups are my favorites, and I absolutely love this film! Looks delish. I love that movie and Tuscany would be my dream vacation spot. I'm reading a foodie book about the Orvieto region of Italy and loving it. The soup is such a gorgeous color. 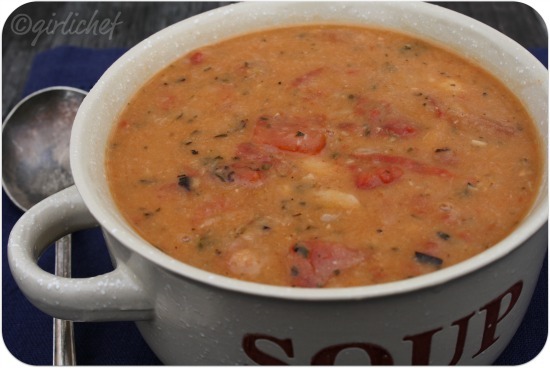 I love bean soup and must try this version. I share your love of chick flicks as well. A hearty Bean soup is always welcome. So rich and flavorful, a perfect companion for a movie night. Thanks for the delightful entry. I'm all for chick flicks too! Especially when they involve Italy and Italian food. This soup looks delicious! I bet you could almost feel the sun beating down on you while you were eating it! I love white bean soup! This variation looks terrific. This soup looks like the ultimate comfort, hearty meal. Plpease nag me and make sure I make this. 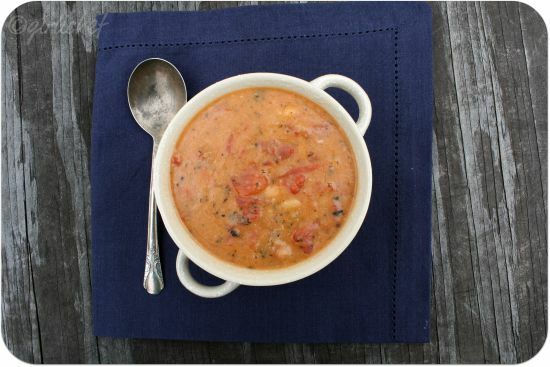 I love all white bean soups and your variation just sings - and then some vinegar drizzled.... and we can toast Tuscany! oh this looks great and not hard at all either! thanks for sharing it at savory sundays!! This is such a comforting bowl of soup..delicious and filling too. Una sopa fabulosa que nos traes. I like the idea of adding pesto in this. Very comforting! I love how thick this looks! Super simple too, I so have to add this to the menu! Thanks! I love that film too and would love to see the actual place...this bean soup looks sumptuous! Wonderful soup,looks filling and comforting.. This looks so delicious. Wish I could also watch the movie with a bowl of your soup now! :) Love your soup bowl btw! Heather...this soup looks and sounds so wonderful!!! Today is definitely soup weather in Ohio ( actually ALL week...so sad!) I wish I had a nice warm bowl of it right now! omg, catching up on your blog was so mouthwatering, i want that soup, and i really want the spaghetti fritter below too. you have the most delicious dishes! I do believe this is the perfect soup! Exquisita sopa es una delicia ,se ve contundente y muy linda,especial para el otoño hace mucho frío,cariños y abrazos.buena semana para tí. Sounds so good, I love Tuscan flavors! Holey moley that's a lot of garlic! Looks delicious though. Rifling through the pantry now to see what ingredients I have . . . Thanks for joining in MLLA 35. I'll be in touch shortly to sort out your bean prize - more for the pot!